What do you do when your city is receiving 12,600 tons of trash every day and the local landfill is taking over the town? The answer: you address two problems in one through the creation of a trash for food program. This is what Mexico City did to help reduce the overwhelming Bordo Poniente landfill and help their local citizens have access to healthy food. Although the infamous landfill was closed in 2012, a location the size of Mexico City continues to create mountains of trash, and it was becoming an overwhelming problem. The city government instituted a program entitled Mercado de Trueque. Members of the local community make their visit to the local market and bring their recyclable plastic, glass, paper, aluminum and cardboard waste. In turn, they are giving ‘green point’ vouchers that can be used in exchange for food from the local market vendors. The vouchers can be used to pickup additional items such as vegetable plants, which allows their community to plant and grow their own healthy foods. This ingenious program is one of the first of its kind and sends a powerful message of support to the residents of Mexico City for both the ecological care of their town and the awareness of the city to provide healthy food for the community. The introduction of this program brought so many residents that on the first day it was ‘sold out’, as the community exchanged almost three tons of 60 agricultural products for trash. This is an example of creating a sustainable solution for what seemed to be an insurmountable problem. The program not only brings a level of awareness to the population of the area for preserving their town, but gives the residents an opportunity to buy locally grown produce and an encouragement to grow their own. The Mexican Environmental agency applauds the efforts and has indicated that is an example of how the local citizens can have a direct and tangible effect on the exchange of what is called trash, into raw materials. The program is also designed to make overall changes to the population. 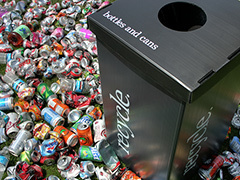 The alterations will bring a conscious effort to the forefront of the public to be aware of the dangerous effect of waste pollution on their community and give them the conceptual understanding of how a sustainable recycling program can be of benefit to their families, the community and global pollution. The program brings the topic down to a level that the people can understand and both see and experience the benefits of their efforts. The global community is watching the success of the Mexico City experiment and paying attention that this may be something that can appeal to areas around the world. In the case of this program, the community, the vendors and the people are all experiencing the benefits of lowered pollution and a higher quality of food and health. This is a true multiplex success for Mexico City and its people and may be destined to be the base program for other communities around the world. Posted on April 9th under Pollution Reduction.